Reserve funds are essential to the successful operation of a community association—not just an extra expense. In many states they are mandated, and boards need to understand how to comply with these laws. This guide contains everything you need to know to establish the right funds and invest them responsibly. Understand the two parts of a reserve study—the financial analysis and the component inventory, and find out how to develop each. Learn how to educate homeowners about the value of reserves, what investments may or may not be suitable for your association, how to develop an investment policy and more. Chart: The Update Test—does your reserve study need to be updated? How to deal with the discontinuation of the AICPA Common Interest Realty Association Audit and Accounting Guide. Reserve Funds is one of six components in the CMCA Study Kit [M5134]. Who Should Prepare the Reserve Study? How Often Should Associations Conduct a Reserve Study? One of the primary business duties of community associations-planned communities, condominium associations, and cooperatives-is maintaining and preserving property values of individual and common property. To do this properly, associations must develop funding plans for future repair or replacement of major common-area components, such as roofs, boilers, elevators, swimming pool components, balconies, seawalls, asphalt surfaces, decks and more. An association has several funding options, including periodic assessments over the life of assets, special assessments at the time of replacement, borrowing funds when needed, a combination of the above, or the most common method (and in some states the only lawful one): setting aside monies in what is commonly called reserve funds, replacement reserves, replacement funds or simply reserves. 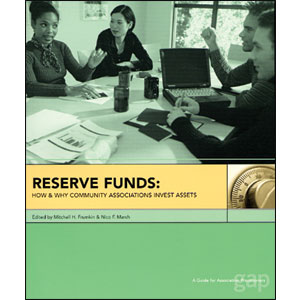 To help associations learn the specifics of reserve funding, this guide presents the theory behind the preparation of a reserve study, the methods for developing a realistic funding plan, a discussion of the various funding techniques, strategies for investing the reserve funds, and additional information on financial reporting and tax implications of reserves. In addition, this guide explains how to view the reserve study components as part of the association's overall budget and how to take advantage of the relationship between replacement reserves, maintenance and energy costs to save money. Reserve funds are required by association governing documents and, in some cases, by state law. Associations should hire a qualified, experienced professional to prepare the association's reserve study. Reserve studies can be used to assess the real costs of ongoing maintenance of common elements and the energy needed to operate them. Reserve studies comprise two parts: A physical analysis that provides information about the physical condition of the major common-area components, and a financial analysis that provides information necessary to maintain the fund appropriately. Associations can use one of four reserve funding plans successfully; each establishes adequate reserves that prevent a deficit due to under funding. Boards have a fiduciary responsibility to all owners to make sure reserve funds are invested properly. Certain types of investments are appropriate for community associations and others are not. Association leaders should develop an investment plan that provides continuity and relative financial safety. Boards must make informed and prudent decisions where to purchase specific investments and who to hire for professional investment advice. Associations should consult a tax professional or CPA since taxes will have a direct bearing on the investment vehicles and investment strategy the association employs. Reserve funds must be accounted for appropriately and accurately in the budget, financial statements, audit, and other records of the association according to strict industry standards.